The Gibraltarian singer, songwriter, and record producer Albert Hammond will be performing live on stage at 3Arena on Sat 16th September 2017 @6:30pm. 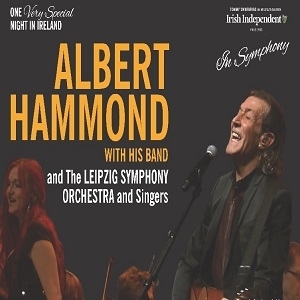 Albert will be with his band and the acclaimed Leipzig Symphony Orchestra and Singers. In a career that's spanned over five decades, Albert Hammond has had huge solo hits with It Never Rains In Southern California, I'm A Train and The Free Electric Band as well as bringing Grammy and Ivor Novello award-winning chart success to the songbooks of Leo Sayer, Diana Ross, Whitney Houston, Aswad, Starship, The Hollies and many many more. Now you can hear songs such as When I Need You, One Moment In Time, The Air That I Breathe and Nothing's Gonna Stop Us Now redefined with the elegance and emotional power of a full symphonic orchestral arrangement.